Acne vulgaris is a multifactorial disorder affecting the pilosebaceous unit within the skin. The pathogenesis of acne involves increased sebaceous gland activity, increased androgenetic stimulation, increased Propionibacterium acnes activity, and the release of inflammatory cytokines1. Clinically, the morphology of active acne lesions can include comedones, papules, pustules and nodules. Scarring is a common sequelae of acne vulgaris as it has been reported that up to 95% of patients with acne experience some degree of scarring. Scarring from acne is typically related to the severity of active lesions and delay in treatment. Acne can cause atrophic or hypertrophic scarring and can be further subdivided into three main subtypes: rolling, boxcar, and ice pick2–4. Though prevention of active lesions is the primary treatment goal for acne, the resulting scarring can lead to significant psychosocial distress5. Surgical and procedural management are considered to be effective treatments for acne scars6. The authors will review different therapeutic modalities for acne scars with emphasis placed on recent studies. A literature search was performed through PubMed and MEDLINE. Keywords in searches included words pertaining to acne and scarring including but not limited to: ‘acne’ and/or ‘acne scars’ combined with one of the following, ‘fillers’, ‘chemical peels’, ‘lasers’, ‘fractional photothermolysis’, ‘radiofrequency’, ‘microneedling’, and ‘plasma rich platelet’. A manual review of the reference list from the acquired articles was also performed. The results are set out below. Chemical peels utilize different chemical solutions that are applied directly to the skin to destroy the epidermis and potentially the dermis depending on the depth of the peel and desired effect of treatment7. Salicylic acid is a beta hydroxy acid and a superficial chemical peel that is generally used in the treatment of active acne and its related dyspigmentation as opposed to atrophic acne scars. Salicylic acid has comedolytic and sebostatic properties that can treat non-inflammatory and inflammatory acne and can also be safely used in darker skinned patients8. Salicylic acid has been directly compared to glycolic acid for the treatment of active acne lesions and was shown to have comparable efficacy with fewer adverse effects9,10. For erythema or hyperpigmentation related to resolving acne, application of 30% salicylic acid every 3–4 weeks for 3–5 treatments has been shown to be efficacious11. Side effects of salicylic acid include mild, transient dryness and erythema12. Salicylism can occur with application of salicylic acid to large areas due to systemic absorption, but the risk is rare and is associated with treatment of more than 50% body surface area13. Pyruvic acid is an alpha-keto acid that has been utilized in the treatment of acne scars as a medium depth peel. Pyruvic acid has keratolytic and sebostatic properties while also promoting collagen production and elastic fiber formulation14. Pyruvic acid has been studied more for the treatment of active acne lesions but has also been shown to be effective in the treatment of acne scars at a 50% concentration14,15. Adverse events can include peeling, crusting, and a burning/stinging sensation. Proper ventilation should be utilized as the vapors from pyruvic acid can be irritating to the upper respiratory tract6. Glycolic acid is an alpha hydroxyl acid that is considered a superficial to medium depth peel that penetrates different layers of the epidermis depending on the concentration utilized. Glycolic acid has exfoliative properties that cause desquamation and epidermolysis. For acne scarring specifically, glycolic acid has shown to increase dermal hyaluronic acid and collagen gene expression7,16. Glycolic acid peels have to be neutralized and are applied for a variable amount of time every 2 weeks until the desired effect is achieved17. More recently, glycolic acid has been shown to improve superficial to moderately deep scars when used in combination with microneedling18. Significant side effects include temporary hyperpigmentation, skin irritation, and erythema, but it is considered a safe and tolerable superficial peel17. Trichloroacetic acid (TCA) is classically used as a superficial to medium depth peel depending on the concentration used, and is considered to be highly efficacious for the treatment of acne scarring7. TCA has shown to cause coagulation of epidermal and dermal proteins leading to collagen necrosis resulting in an increased volume of collagen and glycosaminoglycosides within the dermis19,20. The protein degeneration from the application of TCA leads to the immediate white frosting seen with its application. The type of frosting correlates with the depth of penetration with speckled white frosting indicating a superficial peel, while a diffuse white frosting with or without erythema indicates a medium depth peel. Higher concentrations are typically not diffusely used in higher Fitzpatrick skin types due to the risk of hypo/hyperpigmentation. TCA peels have been shown to be effective in combination with other modalities including Jessner’s solution, glycolic acid, and fractional CO2. More recently, one group reported clinical improvement of acne scars utilizing 20% TCA with subcision and fractional CO2 laser. Side-effects can include stinging and burning during application, erythema, hyper/hypopigmentation, and skin irritation, but is generally considered safe and tolerable. The CROSS (Chemical Reconstruction Of Skin Scars) is a recently described technique used for the treatment of ice-pick or boxcar scars. The CROSS technique involves applying high concentrations of TCA (50–100%) focally at the entire base of the scar. This leads to immediate epidermal necrosis followed by dermal collagen remodeling that may continue for several months. Anesthesia is not used as patients are generally able to tolerate the mild burning following application. The lesions have the typical immediate TCA frost with erythema/edema that decreases in 4–6 hours. A crust forms the next day that falls off in 3–4 days. Treatment adverse effects are limited and include the aforementioned erythema, edema, burning, as well as hyper- and hypopigmentation that are transient21. It has also been shown to be safe and effective for the use in darker Fitzpatrick skin types IV–V due to the focal nature of application22. Treatment can be repeated two or three times every 2 to 4 weeks. In a recent study, 53 patients with atrophic acne scars, including boxcar scars, were treated with 70% TCA using the CROSS technique and 66% of patients experienced above 50% clinical improvement and 81.1% of patients were satisfied or very satisfied with the treatment23. 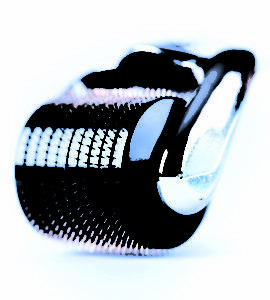 The CROSS technique has the advantage of sparing normal surrounding skin allowing for a more rapid recovery time and minimal complications21. Jessner’s solution is a combination solution of 14g salicylic acid, 14g resorcinol, 14g lactic acid, and 95% ethanol in 100 mL. It is a superficial peel when used alone and thus is effective in treating superficial acne scars. The depth of penetration can be titrated based on the amount of coats applied on the skin. Application of 1–3 coats of Jessner’s solution leads to a fairly superficial peel that results in faint erythema associated with a subtle whitening of the skin, while application of 4–10 coats leads to more prominent erythema and focal areas of white frosting24,25. Side-effects of the peel include a burning/stinging sensation during and immediately postoperative, as well as mild desquamation and transient skin discoloration24. Jessner’s solution is typically used with TCA to achieve a medium depth peel. Recently, a modified Jessner’s solution combined with 20% TCA compared to 20% TCA alone resulted in a marked improvement of acne scarring in both groups, though the results were not statistically significant20. Jessner’s solution has also shown to be safely used in combination with 35% TCA in darker skinned individuals with no evidence of long-term dyspigmentation, though a majority of patients did experience transient hyperpigmentation26. Phenol is a deep peel that can be used for the treatment of atrophic acne scars, but limitations exist due to the complications and the downtime for recovery. Phenol peels reach the mid-reticular dermis and stimulate the production of collagen via dermal elastolysis and epidermolysis27. Given the depth of the peel and risk of dyspigmentation, phenol peels are generally avoided in darker skinned individuals7,28. A recent study compared the use of 90% TCA application via the CROSS technique and 88% phenol and found a significant improvement of atrophic acne scars; however, the pain/discomfort was significantly more in the phenol group29. Cutaneous side effects include erythema, dyspigmentation, and pain. Systemic risks include cardiac arrhythmia and toxicity; therefore, cardiac monitoring is required during the procedure28. Laser treatment is an effective and easy treatment modality for boxcar scars and rolling scars but is not as useful for deeper ice-pick scars. Lasers are often used in conjunction with other treatment modalities to increase efficacy while maintaining a favorable side-effect profile30. There are many types of lasers that can be used for acne scars with fractional photothermolysis representing a more recent advancement31. Conventional ablative lasers melt and vaporize tissue resulting in the improvement of acne scars. The two most common ablative lasers that are used are the carbon dioxide laser and the Erbium-doped:Yttrium aluminum garnet (Er:YAG) laser. Carbon dioxide lasers (10600 nm) have a lower selectivity for water than Er:YAG, and as a result, not all of the energy is absorbed in the epidermis leading to residual thermal damage in the dermis. The thermal injury causes the dermal production of myofibroblasts and hyaluronic acid that can improve acne scarring. Er:YAG lasers work primarily by ablation of the epidermis as almost all of the energy is absorbed in the epidermis and superficial dermis. Er:YAG lasers do not exert as much of an effect on the dermis compared to the carbon dioxide lasers, and therefore have quicker recovery times and fewer adverse events. Side-effects of ablative lasers include erythema, dyspigmentation, infection, scarring, and a prolonged downtime in comparison to other treatment modalities24,31,32. 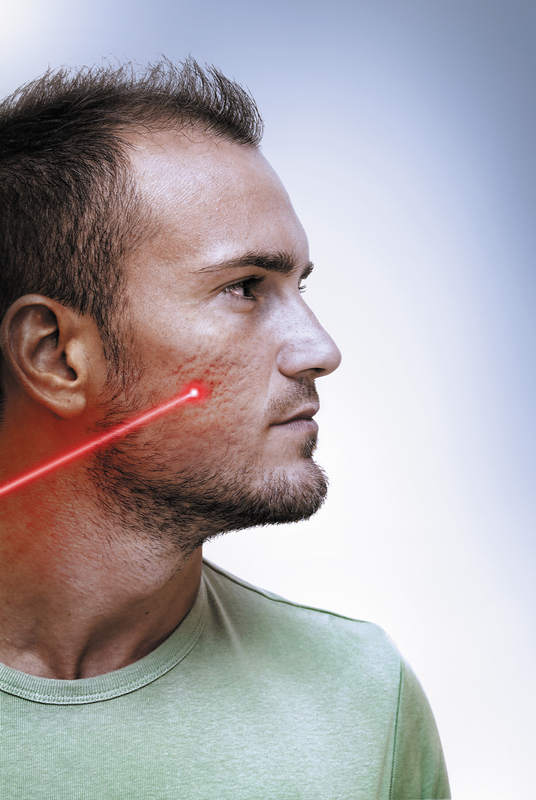 A recent study comparing carbon dioxide lasers and Er:YAG lasers reported increased erythema, dyspigmentation, and downtime in patients treated with the carbon dioxide laser33. Nonablative lasers generally have a decreased risk of complications from therapy compared to ablative lasers and have become more popular for treating acne scars. There are several types of nonablative lasers available including a 1450 nm diode laser, 1320 nm or 1064 nm neodymium-doped yttrium aluminum garnet (Nd:YAG) lasers, and a 1540 nm erbium glass laser6. Nonablative lasers spare the epidermis and instead cause a controlled thermal injury to the dermis, promoting collagen production. However, nonablative lasers have been noted to have decreased efficacy when compared to ablative lasers34. Fractional photothermolysis is a newer modality being used for the treatment of acne scars and is available as ablative and nonablative. Nonablative fractional lasers create microscopic thermal wounds that produce collagen production within the dermis while sparing the overlying epidermis, leading to decreased adverse effects compared to conventional ablative lasers including shorter downtime. Ablative fractional lasers combine carbon dioxide ablation with fractional photothermolysis resulting in superior efficacy compared to nonablative fractional lasers. Ablative fractional lasers have decreased recovery time and side-effects compared to conventional ablative carbon dioxide lasers. In a recent study comparing four different lasers for acne scars (conventional carbon dioxide, Er:YAG, nonablative fractional, and ablative fractional lasers), ablative fractional lasers resulted in similar improvement of acne scars compared to carbon dioxide and Er:YAG lasers and was associated with decreased recovery period and complication risks. Though, patients treated with ablative fractional lasers did require more treatments compared to the carbon dioxide and Er:YAG laser group. Patients in the nonablative fractional laser treatment group had a significantly lower clinical improvement compared to the other three modalities33. The superior adverse effect profile of ablative fractional lasers versus conventional ablative lasers is thought to occur because the microscopic wounds created by fractional photothermolysis is surrounded by healthy, undamaged tissue, leading to rapid reepithelization35,36. Dermal fillers are effective for treating atrophic acne scars. Typically, fillers are injected directly under the scar into the superficial and mid dermis, with caution not to over correct as touch-up sessions can be performed at future visits37. There are several types of fillers that can be used, but the most common are polymethylmethacrylate (PMMA) and hyaluronic acid37. Recently, Bellafill™ (previously known as Artefill™) (Suneva Medical, Inc,) became the first Food and Drug Administration approved medical device for the treatment of acne scars and is composed of 20% PMMA microspheres by volume suspended in 80% bovine collagen gel by volume. PMMA is a synthetic permanent filler and has shown to be effective with longer lasting results up to 12 months38. In a recent study, treatment with two injections of Bellafill™ resulted in significant improvement of rolling acne scars when compared to the control group receiving sterile saline injections39. Adverse effects were mild and included bruising, pain, redness, and lumpiness. The adverse effects of PMMA can be long lasting since PMMA is a permanent filler39. Hyaluronic acid fillers have been a mainstay for the treatment of acne scars. Hyaluronic acid fillers result in immediate soft tissue augmentation while also stimulating native fibroblasts to produce collagen40. There are many available types of hyaluronic acid fillers that differ due to their varying properties including cross-linking type, hyaluronic acid concentration, and viscosity37. Hyaluronic acid fillers are favorable due to their low allergenicity and the ability to reverse their effects with hyaluronidase41. 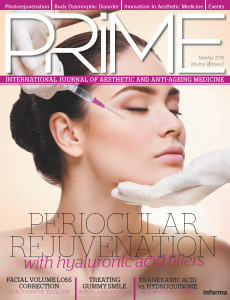 Patients treated with microinjections of various hyaluronic acid fillers experienced improvement of their acne scars with minimal side-effects similar to PMMA42,43. Nodule formation is a less common adverse event but can be treated with hyaluronidase41. Subcision has been used in the treatment of rolling acne scars. Subcision works by repetitively passing an instrument within the dermis and breaking up the fibrotic strands underlying acne scars. Various tools have been used for subcision including hypodermic needles, blunt blades, and cannulas. Repeated treatments are usually required; however, subcision has the advantage of not injuring the skin surface. Subcision has also been used in combination with almost all therapeutic modalities of acne treatment with significant improvement of acne scars44–46. Side-effects of subcision typically include pain, bruising, transient discoloration, and recurrence, but overall it is well tolerated. Radiofrequency utilizes electromagnetic radiation for the treatment of acne scars. At the site of application, the device sends a radiofrequency current between needle-fine pairs of electrode resulting in deep dermal thermal injury. This induces a wound healing response that stimulates dermal collagen remodeling and can improve acne scars47. Fractional bipolar radiofrequency devices are a recent advancement as they cause low epidermal disruption in addition to dermal injury resulting in significant improvement of acne scars. Side-effects of radiofrequency include dyspigmentation, erythema, pain and crusting47–49. Microneedling, often referred to as percutaneous collagen induction, has been discussed for the treatment of acne scars. Microneedling typically involves a device consisting of multiple fine needles (0.5–2.0 mm in length) attached to a barrel and rolling it directly onto the skin. The needles create several pinpoint punctures to the level of the mid to papillary dermis. The micropunctures release growth factors promoting the production of dermal collagen and elastin. There have been multiple studies reporting the effectiveness of microneedling for acne scarring though the treatments often have to be repeated up to three times50,51. To maximize efficacy, microneedling is frequently used in conjunction with various other therapeutic modalities including enhancing transdermal drug delivery of topical medications52. Microneedling is considered safe for all skin types as the risk of dyspigmentation is low and has minimal downtime when compared to other resurfacing procedures. Platelet-rich plasma (PRP) is a newer technique that has been reported for use in acne scars. PRP is an autologous concentrated plasma solution obtained from centrifuging down the patient’s own blood. PRP is typically injected into the skin at regularly spaced intervals and is thought to release growth factors that accelerate soft tissue regeneration53. PRP for acne scarring has been mostly studied in combination with fractional ablative lasers and microneedling and has shown to augment the effect of both treatment modalities, though studies have been conflicting53–55. Further studies are needed to assess the efficacy and safety of PRP for acne scarring. There are many different treatments for acne scarring, and each modality has a role in treating acne scars. Initial scar assessment can help determine the type of treatment required for a specific patient. The patient’s expectations and ability to tolerate and recover from a procedure should also be accounted for in order to obtain the best outcome. There have been many advancements and recent studies as outlined above and the authors are excited for more to come.
. Bhat, Y. J., Latief, I. & Hassan, I. Update on etiopathogenesis and treatment of Acne. Indian J. Dermatol. Venereol. Leprol. 83, 298–306 (2017). Jacob, C. I., Dover, J. S. & Kaminer, M. S. Acne scarring: a classification system and review of treatment options. J. Am. Acad. Dermatol. 45, 109–117 (2001). Layton, A. M., Henderson, C. A. & Cunliffe, W. J. A clinical evaluation of acne scarring and its incidence. Clin. Exp. Dermatol. 19, 303–308 (1994). Abdel Hay, R. et al. Interventions for acne scars. Cochrane Database Syst. Rev. 4, CD011946 (2016). Tan, J. et al. The Relationship Between Dermatologist- and Patient-Reported Acne Severity Measures and Treatment Recommendations. J. Cutan. Med. Surg. 19, 464–469 (2015). Fabbrocini, G. et al. Acne scars: pathogenesis, classification and treatment. Dermatol. Res. Pract. 2010, 893080 (2010). Kontochristopoulos, G. & Platsidaki, E. Chemical peels in active acne and acne scars. Clin.Dermatol. 35, 179–182 (2017). Grimes, P. E. The safety and efficacy of salicylic acid chemical peels in darker racial-ethnic groups. Dermatol. Surg. Off. Publ. Am. Soc. Dermatol. Surg. Al 25, 18–22 (1999). Kessler, E., Flanagan, K., Chia, C., Rogers, C. & Glaser, D. A. Comparison of alpha- and beta-hydroxy acid chemical peels in the treatment of mild to moderately severe facial acne vulgaris. Dermatol. Surg. Off. Publ. Am. Soc. Dermatol. Surg. Al 34, 45–50; discussion 51 (2008). Garg, V. K., Sinha, S. & Sarkar, R. Glycolic acid peels versus salicylic-mandelic acid peels in active acne vulgaris and post-acne scarring and hyperpigmentation: a comparative study. Dermatol. Surg. Off. Publ. Am. Soc. Dermatol. Surg. Al 35, 59–65 (2009). Lekakh, O. et al. Treatment of Acne Vulgaris With Salicylic Acid Chemical Peel and Pulsed Dye Laser: A Split Face, Rater-Blinded, Randomized Controlled Trial. J. Lasers Med. Sci. 6, 167–170 (2015). Al-Talib, H., Al-khateeb, A., Hameed, A. & Murugaiah, C. Efficacy and safety of superficial chemical peeling in treatment of active acne vulgaris. An. Bras. Dermatol. 92, 212–216 (2017). Madan, R. K. & Levitt, J. A review of toxicity from topical salicylic acid preparations. J.Am. Acad. Dermatol. 70, 788–792 (2014). Berardesca, E., Cameli, N., Primavera, G. & Carrera, M. Clinical and instrumental evaluation of skin improvement after treatment with a new 50% pyruvic acid peel. Dermatol. Surg. Off. Publ. Am. Soc. Dermatol. Surg. Al 32, 526–531 (2006). Jaffary, F., Faghihi, G., Saraeian, S. & Hosseini, S. M. Comparison the effectiveness of pyruvic acid 50% and salicylic acid 30% in the treatment of acne. J. Res. Med. Sci. Off. J. Isfahan Univ. Med. Sci. 21, 31 (2016). Bernstein, E. F., Lee, J., Brown, D. B., Yu, R. & Van Scott, E. Glycolic acid treatment increases type I collagen mRNA and hyaluronic acid content of human skin. Dermatol. Surg. Off. Publ. Am. Soc. Dermatol. Surg. Al 27, 429–433 (2001). Sharad, J. Glycolic acid peel therapy – a current review. Clin. Cosmet. Investig. Dermatol. 6, 281–288 (2013). Sharad, J. Combination of microneedling and glycolic acid peels for the treatment of acne scars in dark skin. J. Cosmet. Dermatol. 10, 317–323 (2011). Butler, P. E. et al. Quantitative and qualitative effects of chemical peeling on photo-aged skin: an experimental study. Plast. Reconstr. Surg. 107, 222–228 (2001). Puri, N. Efficacy of Modified Jessner’s Peel and 20% TCA Versus 20% TCA Peel Alone for the Treatment of Acne Scars. J. Cutan. Aesthetic Surg. 8, 42–45 (2015). Lee, J. B., Chung, W. G., Kwahck, H. & Lee, K. H. Focal treatment of acne scars with trichloroacetic acid: chemical reconstruction of skin scars method. Dermatol. Surg. Off. Publ. Am. Soc. Dermatol. Surg. Al 28, 1017–1021; discussion 1021 (2002). Khunger, N., Bhardwaj, D. & Khunger, M. Evaluation of CROSS technique with 100% TCA in the management of ice pick acne scars in darker skin types. J. Cosmet. Dermatol. 10, 51–57 (2011). Agarwal, N., Gupta, L. K., Khare, A. K., Kuldeep, C. M. & Mittal, A. Therapeutic response of 70% trichloroacetic acid CROSS in atrophic acne scars. Dermatol. Surg. Off. Publ. Am. Soc. Dermatol. Surg. Al 41, 597–604 (2015). Gozali, M. V. & Zhou, B. 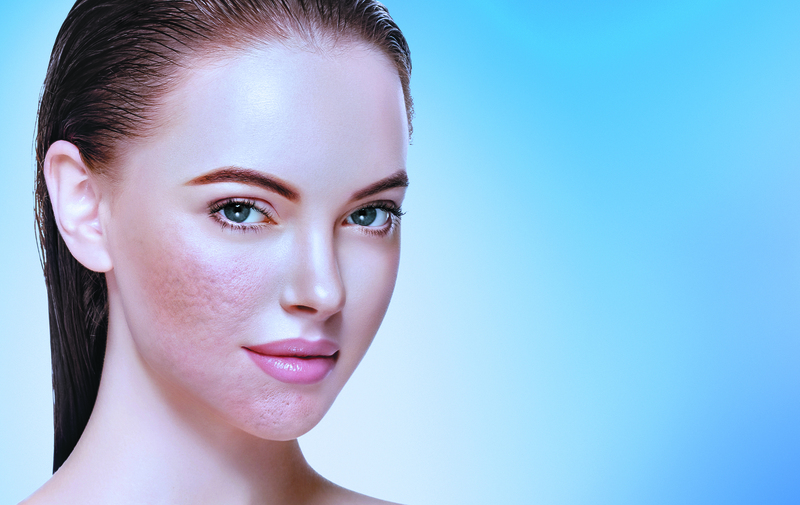 Effective treatments of atrophic acne scars. J. Clin. Aesthetic Dermatol. 8, 33–40 (2015). Clark, E. & Scerri, L. Superficial and medium-depth chemical peels. Clin. Dermatol. 26, 209–218 (2008). Al-Waiz, M. M. & Al-Sharqi, A. I. Medium-depth chemical peels in the treatment of acne scars in dark-skinned individuals. Dermatol. Surg. Off. Publ. Am. Soc. Dermatol. Surg. Al 28, 383–387 (2002). Leheta, T. M., Abdel Hay, R. M. & El Garem, Y. F. Deep peeling using phenol versus percutaneous collagen induction combined with trichloroacetic acid 20% in atrophic post-acne scars; a randomized controlled trial. J. Dermatol. Treat. 25, 130–136 (2014). Nikalji, N., Godse, K., Sakhiya, J., Patil, S. & Nadkarni, N. Complications of medium depth and deep chemical peels. J. Cutan. Aesthetic Surg. 5, 254–260 (2012). 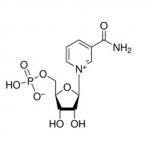 Dalpizzol, M., Weber, M. B., Mattiazzi, A. P. F. & Manzoni, A. P. D. Comparative Study of the Use of Trichloroacetic Acid and Phenolic Acid in the Treatment of Atrophic-Type Acne Scars: Dermatol. Surg. 42, 377–383 (2016). Zaleski-Larsen, L. A., Fabi, S. G., McGraw, T. & Taylor, M. Acne Scar Treatment: A Multimodality Approach Tailored to Scar Type. Dermatol. Surg. Off. Publ. Am. Soc. Dermatol. Surg. Al 42 Suppl 2, S139-149 (2016). 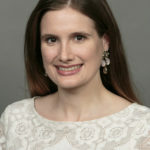 Cohen, B. E., Brauer, J. A. & Geronemus, R. G. Acne scarring: A review of available therapeutic lasers. Lasers Surg. Med. 48, 95–115 (2016). Kim, S. Clinical trial of a pinpoint irradiation technique with the CO2 laser for the treatment of atrophic acne scars. J. Cosmet. Laser Ther. Off. Publ. Eur. Soc. Laser Dermatol. 10, 177–180 (2008). You, H.-J., Kim, D.-W., Yoon, E.-S. & Park, S.-H. Comparison of four different lasers for acne scars: Resurfacing and fractional lasers. J. Plast. Reconstr. Aesthetic Surg. JPRAS 69, e87-95 (2016). Hession, M. T. & Graber, E. M. Atrophic Acne Scarring. J. Clin. Aesthetic Dermatol. 8, 50–58 (2015). Waibel, J., Beer, K., Narurkar, V. & Alster, T. Preliminary observations on fractional ablative resurfacing devices: clinical impressions. J. Drugs Dermatol. JDD 8, 481–485 (2009). Hantash, B. M. et al. In vivo histological evaluation of a novel ablative fractional resurfacing device. Lasers Surg. Med. 39, 96–107 (2007). Wollina, U. & Goldman, A. Fillers for the improvement in acne scars. Clin. Cosmet.Investig. Dermatol. 8, 493 (2015). Bagal, A., Dahiya, R., Tsai, V. & Adamson, P. A. Clinical experience with polymethylmethacrylate microspheres (Artecoll) for soft-tissue augmentation: a retrospective review. Arch. Facial Plast. Surg. 9, 275–280 (2007). Karnik, J. et al. A double-blind, randomized, multicenter, controlled trial of suspended polymethylmethacrylate microspheres for the correction of atrophic facial acne scars. J. Am. Acad. Dermatol. 71, 77–83 (2014). Turlier, V. et al. Association between collagen production and mechanical stretching in dermal extracellular matrix: in vivo effect of cross-linked hyaluronic acid filler. A randomised, placebo-controlled study. J. Dermatol. Sci. 69, 187–194 (2013). Rzany, B., Becker-Wegerich, P., Bachmann, F., Erdmann, R. & Wollina, U. Hyaluronidase in the correction of hyaluronic acid-based fillers: a review and a recommendation for use. J. Cosmet. Dermatol. 8, 317–323 (2009). Halachmi, S., Ben Amitai, D. & Lapidoth, M. Treatment of acne scars with hyaluronic acid: an improved approach. J. Drugs Dermatol. JDD 12, e121-123 (2013). Hasson, A. & Romero, W. A. Treatment of facial atrophic scars with Esthélis, a hyaluronic acid filler with polydense cohesive matrix (CPM). J. Drugs Dermatol. JDD 9, 1507–1509 (2010). Lee, S. J. et al. The efficacy and safety of subcision using CO2 gas combined with fractional laser for acne scars: Clinical and microscopic evaluation. J. Cosmet. Laser Ther. Off. Publ. Eur. Soc. Laser Dermatol. 18, 417–420 (2016). Nilforoushzadeh, M. A. et al. Fractional Carbon Dioxide Laser and its Combination with Subcision in Improving Atrophic Acne Scars. Adv. Biomed. Res. 6, 20 (2017). Forbat, E. & Al-Niaimi, F. Fractional radiofrequency treatment in acne scars: Systematic review of current evidence. J. Cosmet. Laser Ther. Off. Publ. Eur. Soc. Laser Dermatol. 18, 442–447 (2016). Dai, R., Xie, H., Hua, W., Li, X. & Li, L. The efficacy and safety of the fractional radiofrequency technique for the treatment of atrophic acne scar in Asians: A meta-analysis. J. Cosmet. Laser Ther. 0, 1–8 (2017). Alam, M. et al. Efficacy of a needling device for the treatment of acne scars: a randomized clinical trial. JAMA Dermatol. 150, 844–849 (2014). Majid, I. Microneedling Therapy in Atrophic Facial Scars: An Objective Assessment. J. Cutan. Aesthetic Surg. 2, 26–30 (2009). Hou, A., Cohen, B., Haimovic, A. & Elbuluk, N. Microneedling: A Comprehensive Review. Dermatol. Surg. Off. Publ. Am. Soc. Dermatol. Surg. Al 43, 321–339 (2017). Gawdat, H. I., Hegazy, R. A., Fawzy, M. M. & Fathy, M. Autologous platelet rich plasma: topical versus intradermal after fractional ablative carbon dioxide laser treatment of atrophic acne scars. Dermatol. Surg. Off. Publ. Am. Soc. Dermatol. Surg. Al 40, 152–161 (2014). Faghihi, G. et al. Efficacy of autologous platelet-rich plasma combined with fractional ablative carbon dioxide resurfacing laser in treatment of facial atrophic acne scars: A split- face randomized clinical trial. Indian J. Dermatol. Venereol. Leprol. 82, 162–168 (2016). Chawla, S. Split Face Comparative Study of Microneedling with PRP Versus Microneedling with Vitamin C in Treating Atrophic Post Acne Scars. J. Cutan. Aesthetic Surg. 7, 209–212 (2014).